Also A Good Shovelhead Rebuilding Guide! This new guide called Building A Shovelhead Style Engine is the best instructional DVD on motorcycle engine builds on the market. The instructor has a Master rating from Harley Davidson and was a Harley Davidson lead mechanic for several years, and now has a passion for teaching. His style keeps you involved, and his guidance makes it all easy to understand. What you will get is a well produced 2 DVD set that has a total run-time of 97 minutes. 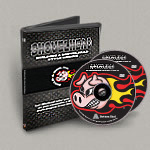 By the time you get through the DVD's you will have the confidence and knowledge to help you build or rebuild a shovelhead engine. And it will always be there for you to pick up and view when and if you need guidance or a refresher on how to build or rebuild a shovelhead engine. Shovelhead Engine Build Side Bar: A Shovelhead rebuild requires more details for the novice engine builder but this DVD set is ideal if you have some experience rebuilding because it provides a road-map for you to follow. 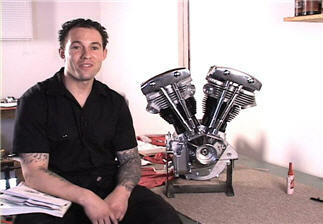 If you want to build a Shovelhead with new parts this DVD set is your step by step guide. Rocker Boxes and Rockers are from Drag Specialties. Although this DVD guide is for someone building a Shovelhead engine, it's also very helpful for someone who wants a guide to rebuilding a Shovelhead motor. Get 'Building A Shovelhead Style Engine' Now. Disc A Bottom End -- Runtime 48 minutes. Final Will The Beast Start? Side Bar: You can use Building A Shovelhead Style Egnine as a guide to tearing down or rebuilding an shovelhead engine. Just keep in mind that the process of rebuilding a shovelhead engine is much more involved with respect to tools and measuring than using new, unworn parts.